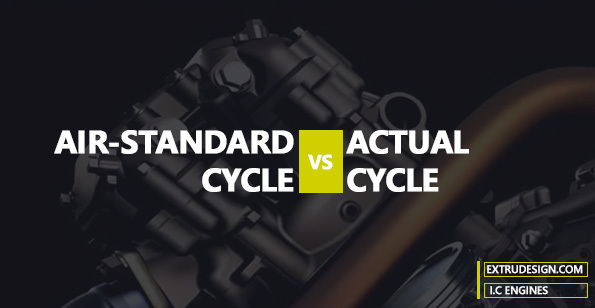 As we discussed the different Air-standard cycles in the previous articles, this article is a Comparison between the Actual Cycles and the Air-standard Cycles. What is the Actual cycle? The Actual cycle in the Thermodynamics is a cycle of operations experienced by the actual Internal combustion engine where the efficiency of this actual Internal combustion engine is much lower than the Ideal cycle or Air-Standard cycle due to various losses in the processes. What are the major losses in the Actual Cycles? Following are the different major losses occurred during the actual cycle. Variation in the specific heat of the fuel for the different temperatures. Heat transfer into the walls of the combustion chamber. Due to the Exhaust-blowdown at the end of the exhaust process. Dissociation of the combustion products. As we said above the actual cycles for the IC engines differ from the Air-standard cycles in many respects. The main differences are listed below. The working substance of the actual cycle is the mixture of the air and fuel vapour along with the combustion products left from the previous cycle. Instead of the instantaneous combustion of the air-fuel mixture progressive combustion. Variation of the specific heats with the temperatures. The change in the composition, temperature and actual amount of the fresh charge because of the residual gases. Change in the chemical composition of the working substance. The major influence in the thermal efficiency and the power output of the engine is exercised by the following three factors. The loss due to the time required for the mixing of fuel and air and also for the combustion. Loss of heat from the gases to the cylinder walls. The loss of work due to the early opening of the exhaust valve in the expansion stroke of the engine. In this article, we have only given the glimpse of what are the different factor that reduces the thermal efficiency and the power output of the actual cycles. In the next articles, we are going to discuss the above three factors in an elaborative manner. Subscribe here. We will get these topics directly into your mailbox for you.